It ain't just for fetus-watching anymore. Engineers from the University of Washington have devised a way to use ultrasound to seal lung punctures. Typically, wounded lungs can be healed when enough pressure is applied to staunch the bleeding. Occasionally doctors have to suction out blood and air from the surrounding area. But in about one-tenth of the cases, extremely invasive operations are needed: ribs have to be separated, long incisions are necessary, the damaged portion is either sewn up or removed. 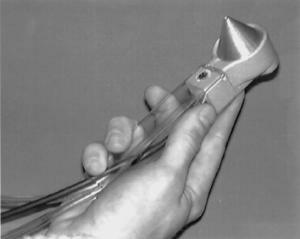 With ultrasound, however, doctors can direct a high-intensity beam at the wound to seal up the fissure [using the hand held device at left]. The heat bonds blood cells even while tissue separating the wound and device stay cool. Ultrasound is amazingly used for so many things in the medical field. It is wonderful it can be used for the purpose of mending a punctured lung as well as so many other things. This field can never find enough qualified workers and the job in itself is rewarding. The heat bonds blood cells even while tissue separating the wound and device stay cool. Cheap 4D Ultrasounds provide a fantastic clear moving image of your unborn baby in an instant, with very plain and clear moving pictures of your new baby in three-dimensions, and can help to put your mind at ease when you see your healthy, moving child developing and growing inside you. It also makes it much easier to spot any potential problems which may occur during the pregnancy.